My favorite Vietnamese noodle joint, Nha Trang, recently pared down their menu and got rid of one of their best items on the menu, the Pho Ga (aka Chicken Pho). It was a sad, sad day. 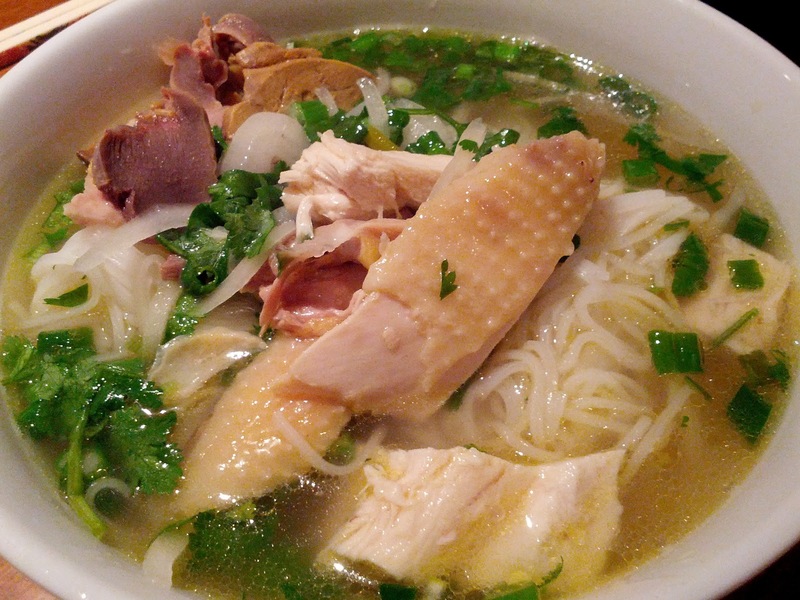 As I've said before, Nha Trang's Pho Ga is Vietnamese chicken noodle soup for the soul. It'll cure hungry stomachs, bad moods, colds, and flus. I swear! Deprived of my delicious, all-powerful cure, I decided to take matters into my own hands today and utilize some of the skills I picked up in Vietnam this past December. By the way, if anyone is interested in cooking classes while visiting Ho Chi Minh, go check out the Vietnam Cookery Center. The prep work was easy. Rich smells of chicken, cinnamon and sweet onions filled my house after 2.5 of cooking and we were ready to eat! I declare this first attempt a success even though I'm missing 3 spices. My large vat of chicken soup. There were 4 chicken carcasses in that pot. I used thin rice stick noodles (about the size of angel hair) because it was what I had on hand. Usually, you would use slightly wider flat rice noodles. 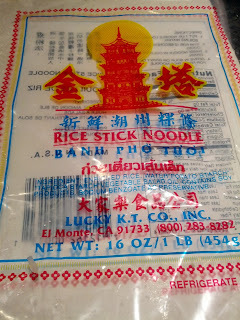 This noodle brand (Lucky Co.) can be found in all Chinese supermarkets in San Gabriel and they make a variety of quality rice noodles. 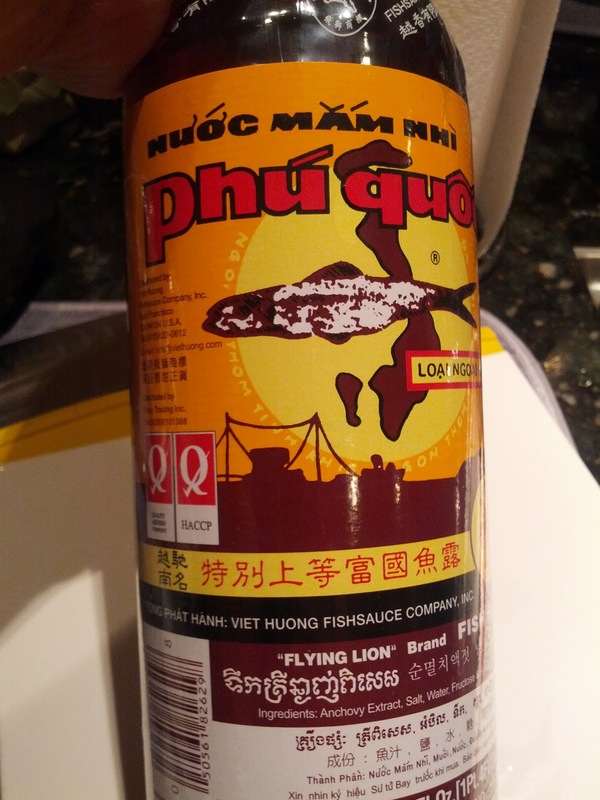 Yes, I was surprised to learn there's fish sauce in Pho Ga. The Vietnam cooking school and two recipe books I bought in Vietnam both suggested using fish sauce. I was skeptical at first but I became a believer once I tasted the great umami flavor the fish sauce added to the soup. This recipe is a combination of what I learned at the cooking school, what I gleaned from the two Vietnamese cookbooks I got in Ho Chi Minh and some of my own instincts. I ended up with enough food to serve three bowls of Pho Ga and enough soup to serve three more bowls tomorrow if I had more noodles and chicken. So, how close was this to Nha Trang's Pho Ga? Well, it is not the same especially since I'm missing some spices to balance out the cinnamon but I think the leeks gave the soup a sweeter kick. Judging from the slurps and the empty bowls, my boyfriend and sister approved of my first attempt at Pho Ga. Heck, I thought it was delicious and pretty darn close to Nha Trang's. I can't wait to buy the rest of the spices I need and cook it again. **I didn't have star anise, cardamon and cloves on hand so I substituted with 2 stalks of trimmed leeks and 5 cloves of garlic which worked pretty well. When using the spices, the ingredient list is just a guidance. Trust your taste buds and feel free to use less or omit if you don't like a certain spice. Some recipes also suggest adding blanched pork bones, dried shrimp, turnip and black pepper to the broth which I didn't like so I omitted it. Cooking is not rigid so let your taste buds guide you and have fun experimenting. 1. Bring a large pot of water to boil. Use a pot that's large enough to submerge a whole 4-lb chicken. Wash and smash half of the ginger. Peel and cut onion in half. Wash and cut the stems of 6 stalks of the green onions. Then, add smashed ginger, 1/2 onion and green onions to the pot before the water comes to a full boil. Cut the head/neck, feet and wing tips off your whole chicken and reserve. No need to wash the chicken. 3. When the water boils, submerge the whole chicken into the pot. Make sure it's fully submerged and no meat is sticking out of the water. (If you're like me and like to eat the chicken liver and gizzards that comes with the whole chicken, you can toss those into the boiling water with the whole chicken.) Then turn off the heat and put the pot lid on. Allow the chicken to slow cook in the water's residual heat (it'll give you meat that's more tender and juicy) for 50 to 60 minutes. You can check for doneness by sticking a chopstick into the thigh and if clear juices flow out then the chicken is done. More time may be needed if the chicken is bigger than 4 pounds. 5. When the chicken is ready, have a large bowl with ice water ready. Lift the chicken out of the pot with tongs and plunge the chicken into the cold water. This helps return a "crunchy" texture to the chicken skin and also helps quickly bring down the temperature so you can proceed with the next steps. Note: Do NOT throw away the pot of of water that the chicken was cooking in. That will be the base of your soup. 6. Bring a medium pot or large wok of water to boil. If you're a multi-tasker in the kitchen like me, you can have that going about 10 minutes before the chicken is done. 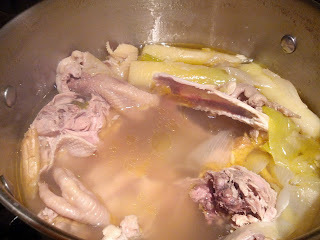 In this pot, you will blanch the chicken bones for a couple of minutes and then drain the and reserve the bones. 7. Add blanched chicken bones and the grilled/broiled ingredients to the pot of chicken water. Bring to a boil and then turn the heat to medium-low to low and boil for about an hour. 8. Meanwhile, your chicken should be cool by now. Have a gallon-size ziplock bag handy. Lift the chicken out of the cold bath and lightly pat dry with paper towels. Put the chicken in the ziplock bag and salt generously with kosher salt. Don't forget to salt the cavity too. Seal the bag and put it in the refrigerator. 9. When soup is done simmering down (the pot's water level will go down by 1.5 to 2 inches), add 2 of teaspoons each of salt, sugar and fish sauce. Taste it and add more of whichever ingredient suits your taste. Let it continue simmering on low while you finish the rest of the prep work. 11. In a separate medium pot or large wok, bring some water to boil (enough to blanch all 16oz of noodles at once). 12. While you're waiting for the water to boil, make the garnish by chopping up the cilantro and green onions and thinly slicing the onions. 13. Arrange three large soup bowls side-by-side. When the water boils, quickly blanch the noodles according to instructions. (Depending on the width you buy, it could be 10 seconds for the thin type or a minute for the flat type.) Drain and divide the noodles amongst the bowls. 14. Garnish the noodles with the cilantro, green onion and sliced onions. Top with pieces of chicken. Ladle hot soup into the bowls. Serve and enjoy right away. You can also add slices of jalapeno, bean sprouts, mint, basil, shredded banana leaf blossoms to the garnish and serve a garlic chili fish sauce for dipping the chicken but I chose to forgo those. Instead, I added a Cantonese touch by making a simple ginger and green onion dip beforehand. Fine chop 3 stalks of green onions and fine grate a piece of fresh ginger about the size of two thumbs. Mix both in a small bowl with some salt (start off easy like 1/4 tsp to see how salty you like it). Heat 3 tablespoons of canola/vegetable oil and when hot, pour the oil into the onion/ginger mixture and stir. Taste and see if it's salty enough. We Cantonese folks like to dip our chicken into this mixture before eating. I have yet to find a grocery store or carniceria on the Westside that sells chicken bones and freshly butchered chickens for a reasonable price. I usually head to Chinatown or San Gabriel where fresh chickens are about $10 and bones cost $1 to $2 a pound at the Chinese butcher shops. The nice thing about these butcher shops is that the bones you get are the entire carcass of the chicken - not odds and ends. I guess these shops fillet a lot of white and dark meat for the supermarkets and then keep the carcasses for folks who need bones for stock. How awesome is that? *It'll be pricier but these are nice ladies doing awesome work and they are closer than Chinatown. Wa-wah, I have two of the spices that you were missing! :P Shall I pass some along? Hi Hungry Kat! Just stumbled across this while looking for cooking classes. Traveling to HCMC in August and I was looking into the Vietnamese cooking center you recommended but wanted to ask you a quick question. I love all vietnamese food but want to be sure the cooking class I take includes Pho (in my opinion, the best there is). Some I've found focus more on satays, spring rolls, etc. Did the class you took at the center make Pho, and did it include a market tour to pick out ingredients? You should email them. They can customize the class for you to learn just noodle soups which is what I did because I wasn't interested in making satays and spring rolls. The class can include a market tour if you want. Have fun in HCMC and stay cool. It's going to be hot!